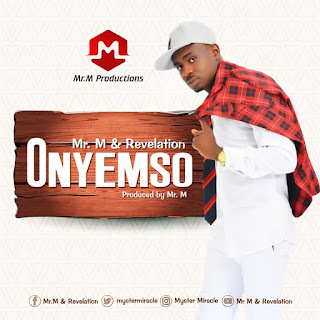 Anointed/talented Gospel music group - Mr. M & Revelation premieres a brand new infectious praise chant titled - 'Onyemso'. The unique Gospel music group which consists of singers, producers and instrumentalists is solely driven by an unquenchable passion to draw men to God through their music ministry. Their latest single title - 'Onyemso' is coined from the indigenous Ibo dialect which translates to ''Whom I Follow'' is a fiery praise anthem guaranteed to have you stunned even as the group takes the time to show their musical versatility and delivery. The Trap/Hip Hop infused tune has the group proclaiming their rightful place in Christ Jesus and their inheritance in Him. Produced by Mr. M for Mr. M Productions. Get on your marks as Mr. M and Revelation takes you on a hip praise marathon unlike any other!